Home » Yesterday » Quick Study: What was the Stamp Act? Quick Study: What was the Stamp Act? The Stamp Act fueled colonial rage. One of the biggest events in world history, the American Revolution, rose in large measure from something very small: stamps. More specifically, the troublemaker was a law imposed by the British government requiring the American colonists to purchase government-issued stamps for myriad documents and papers used by practically everyone in the 13 Colonies—an act that amounted to a tax on those documents. This year is the 250th anniversary of that law, the Stamp Act. The Stamp Act came on top of the Sugar Act a year earlier and “brought about a sudden, unexpected, explosive change” in the way Americans looked at Great Britain, writes Theodore Draper in A Struggle for Power: The American Revolution (1996; Times Books). It represented the clash of two powerful forces: Britain’s desire to rule the Colonies, and the colonists’ desire for more freedom to rule themselves. Protests of “taxation without representation” became louder and more violent after the Stamp Act . Below are some key facts about the Stamp Act. When was the Stamp Act passed? March 22, 1765. It took effect Nov. 1, 1765. Why was the Stamp Act passed? After Britain’s victory in the French and Indian War, which ended in 1763, the government in London had to figure out some way to pay off a sizable war debt and fund troops who would remain in America for protection from future attacks. The answer was to tax the Colonies. On April 5, 1764, Britain had stepped up enforcement of an earlier tax on sugar and molasses imports, while adding taxes on imports of wine, silk, certain types of cloth and other items. The Sugar Act had already put the colonists in a foul mood when the Stamp Act arrived a year later. What items required stamps? Examples include newspapers, advertisements, almanacs, pamphlets, playing cards, college degrees, liquor licenses and legal documents such as attorney licenses, contracts, land grants, wills and papers in court proceedings. All were paper items except one: Dice. What about stamps on mail? The most common place for stamps today—the mail—was not taxed under the act. That’s because postage stamps did not exist until May 6, 1840, when the United Kingdom introduced them, according to the American Philatelic Society’s website. The U.S. government issued its first postage stamp on July 1,1847, notes the Smithsonian Institution’s National Postal Museum. How much was the tax? It varied. The least expensive stamp was one-half penny for a pamphlet or newspaper limited to half a page or less. The priciest was 10 British pounds for attorney licenses, which translates to about $2,475 today, based on a computation using the Bank of England inflation calculator and recent pound-dollar exchange rates. What did the stamps look like? Not much like the stamps we have today. Adhesive stamps—which have a strong gummed substance on the back that sticks to paper—first appeared with the 1840 postage stamps. The 1765 stamps were put on documents in various ways, depending on whether the documents were written on regular paper (typically made from the pulp of linen rags in Colonial times) or on parchment and vellum (two types of writing material made of animal skin). How were the stamps put on regular paper? 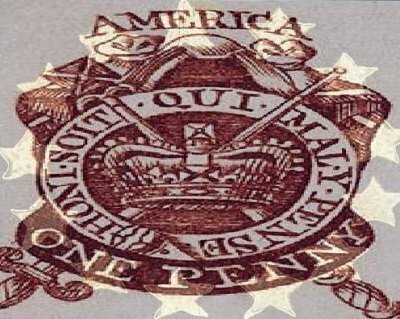 There were two methods, explained philatelist Adolph Koeppel in the book, The Stamps that Caused the American Revolution: The Stamps of the 1765 British Stamp Act for America (1976; American Bicentennial Commission). One method was used for products such as newspapers and almanacs. The stamp design was engraved into a copper plate and printed directly onto a blank sheet of paper in dark, red ink. In the second method, used with other paper items (as well as dice), an engraved image of the stamp was pressed against the paper with enough force to create raised lines in the image of the stamp, a process called embossing. The embossed stamps, which were colorless, looked much like the notary seals stamped on legal documents today to indicate that the signing of the document was witnessed and authenticated. The printing and embossing process took place in Britain, and the stamped sheets of paper were then shipped to America. The Colonists had to buy and use that paper to write or print the publications and documents subject to the tax. What about the stamps on parchment and vellum? The embossing process does not work well on parchment and vellum because their tougher texture makes it difficult for a stamping device to press a strong, clearly visible image on them. The stamp makers came up with alternative, Koeppel says. Before the actual stamp was produced, small pieces of regular paper—slightly larger than the stamp’s image and typically blue or beige—were glued to the taxed parchment or vellum documents. To guard against the possibility of faulty glue, the British added the modern-day equivalent of a staple. They took a soft metal strip 1-inch long and ¼-inch wide and poked each end of the strip through cut slits in the piece of paper. The stamp’s image was then pressed onto the paper and the two metal ends sticking through back were clamped against the parchment. How did the Colonies respond to the Stamp Act? “When news reached America that the Stamp Act had passed, anger erupted first in a torrent of words,” wrote Edmund S. Morgan and Ellen M. Morgan in The Stamp Act Crisis: Prologue to Revolution (1995; University of North Carolina Press). But the words in pamphlets, newspapers and speeches, including calls for boycotts of British goods, would soon be accompanied by the violent action of mobs. Some groups, who called themselves the Sons of Liberty, tried to frighten Britain’s stamp agents by hanging them in effigy. Others seriously damaged and looted the homes of British officials. How did it end? Taken aback by the uproar, Britain repealed the Stamp Act on March 18, 1766, but other taxes and actions the colonists considered affronts to their liberty would follow, culminating in the War for Independence that began with the battles of Lexington and Concord on April 19, 1775. The original text of the law on the Stamp Act History website of the University of Massachusetts History Club. “History of Stamps,” American Philatelic Society website. “Our First Postage Stamp,” by Joseph Geraci, Smithsonian Institution National Postal Museum website. National Postal Museum descriptions of Stamp Act stamps in its collections: 1 penny stamp act proof Embossed stamps. The Stamps that Caused the American Revolution: The Stamps of the 1765 British Stamp Act for America, by Adolph Koeppel, published under the auspices of the Town of North Hempstead, New York, American Revolution Bicentennial Commission, circa 1976. The Stamp Act Crisis: Prologue to Revolution, by Edmund S. Morgan and Ellen M. Morgan, University of North Carolina Press; 1995. A Struggle for Power: The American Revolution, by Theodore Draper, Times Books, a division of Random House Inc. 1996. Quick Study: What was the Sugar Act? If you would like to comment, contact us or like us on Facebook and tell us what you think.